Beginning as campers and staff members and now as owners and directors, Dave Schiff and I have been returning to Manitou since 1987. There are ten current staff members who have been here even longer. campers’ names, younger campers interact regularly with older campers, and all members of the camp community respect one another. Having spent the previous four summers at another camp, the transition to becoming a part of the Manitou family was seamless. Now after spending eight years here, I lead one of the College League teams. Athletic and creative diversity distinguishes the Manitou program. With a choice of more than 40 teaching programs, every camper finds an area in which he will experience success. Manitou promotes team building through inter-camp competition, the College League and the Color War tournament. 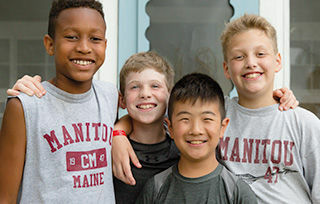 For boys who prefer individual activities, Manitou offers a variety of individual programs for instruction, discovery and fun. Each camper, once accustomed to our program selection, chooses his own activities to pursue each week. With the privilege of choice, boys learn to make decisions and understand the value of responsibility in a comfortable and supportive environment. Camp Manitou is long on history and rich in tradition.